When considering design, vision and philosophy in a Hospital, thoughts should be centred on achieving the most therapeutic and functional buildings for patients. Specific targets around art work, the therapeutic environment, sustainability, design quality and compliance with Part M Building Regulations are paramount during the design stage. 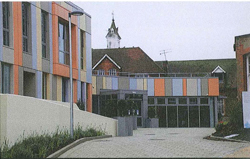 An example of such considerations is Farnham Road Hospital, Guildford. Although they have not installed Ceiling Hoists or Assisted Baths in this refurbishment, the considerations towards design is noteworthy. External design on the inside, and internal designs on the outside provides an enhanced healing environment giving a seamless transition of openness without walls. Access to nature can play an important role in the healing process. A sense of being at one with nature resonates throughout. Earthy colours complement the natural tones of the buff stone and red brick detail of the grade 2 listed building. The vibrant interior design for the public spaces and more restful colours for wards and private areas is linked with trees. The wards are named after trees and the theme runs throughout. Factors such as shape and space, light and colour, the benefits of views and artwork contribute to creating a high quality, sense sensitive environment which supports the user’s well being and aids recovery. Careful consideration of furniture, fixtures and fittings, colours used in the public and private areas, views to courtyards and gardens, and to the community beyond are of particular importance. Natural light is maximised throughout. 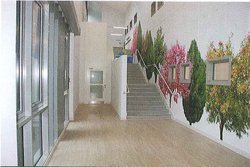 Glazed corridors, staircases and doors opening out of the communal space add to the amount of light entering the building.” – Excerpt from the latest CAE – Access by Design: Journal 144, 2016. OpeMed are delighted to work in partnership with the CAE (Centre for Accessible Environments). For more information on design considerations for Hospitals you can contact the CAE who offer a monthly Access by Design journal and CPD courses.